Excelente relação qualidade/preço. Equipamento de qualidade PREMIUM. Sondas de 96 elementos, multifrequência (5 frequencias). O preço inclui 2 sondas à escoha (microconvexa, convexa, linear, ou linear rectal). Assistência Técnica Qualificada. The user can assign a frequency-used function (e.g. BPD) on certain key (e.g. F1) so as to address veterinary’s preferential demands. Complete reproductive measurement software: Equine, bovine, ovine, canine, feline and primate. 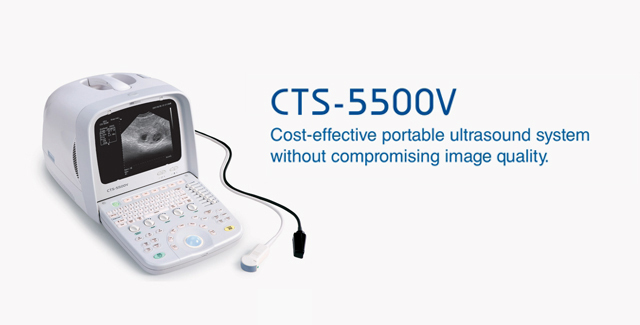 CTS5500V is a new portable ultrasound imaging system, which can be widely applied to various vet diagnosis. It has non-volatile storage capacity and abundant veterinary measurement and calculation package. 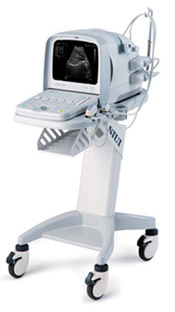 With superb image quality and stable performance, it surely will brings you a fresh and new experience in ultrasound exam. Images can be transferred to PC through RS-232C interface to save and process in JPG, BMP or TIF format, enabling exchange of medical images between medical devices on a network, easy to store and print out. The CTS5500V Ultrasound from SIUI, with its wide-range of available probes and built-in calculation packages, has become our best-selling portable ultrasound across multiple veterinary clinic applications. Now built upon an extremely solid UNIX software platform embedded, the CTS5500V is now even better and reliable. The CTS5500V also now boasts an excellent array of image-management functions, enabling you to not only make all of your measurements and annotations quickly and efficiently, but also allowing you to save images internally or externally (to a USB thumb drive), in a variety of file formats (including the popular .jpg format for saving your captured and annotated images, and even the .avi format for saving your entire cineloop as a video file! ).